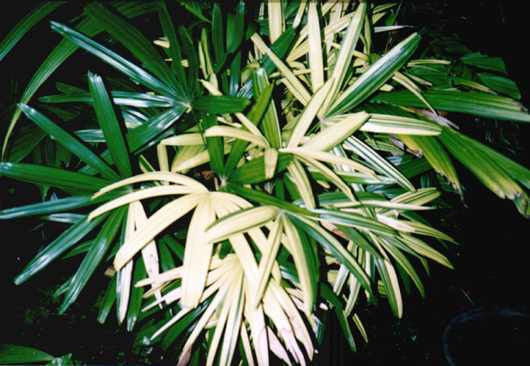 Description: - This form of R. Excelsa Dwarf only grows to 1.5m high leaves are variegated yellow green makes an excellent pot plant for indoors or planted in a rockery. This is one of the more common forms. But is quite easy to grow. Growing Climate: -. Requires shady position water 1 to 2 times a week [you can over water Rhapis] every 2nd or 3rd day seems to be plenty. Fertilize once a year with slow release.